Here’s a stylish bag for men inspired by the medical bags doctors used to carry back in the days of housecalls. At $650, though, the Medico Bag from Qara appears to draw equal inspiration from more recent medical trends, like the skyrocketing costs of health care. 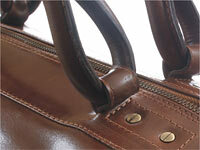 The Medico Bag comes in rich brown “Vintage Vitelo” or dark “Grevy Black” (we think they mean Gray) top-grain leather. There are two zippered pockets inside, plus a slot where you can stow your passport. The handle is attached to the bag with “handmade alpaca nail-head rivets” Alpaca? Yeah, that’s what they say. There’s also a detachable leather shoulder strap. This entry was posted on Monday, June 26th, 2006 at 5:49 pm	and is filed under Man Bags, Manufacturers, Medical Bags, Public Image, Role Models. You can follow any responses to this entry through the RSS 2.0 feed. You can leave a response, or trackback from your own site.